Light weight and versatile. 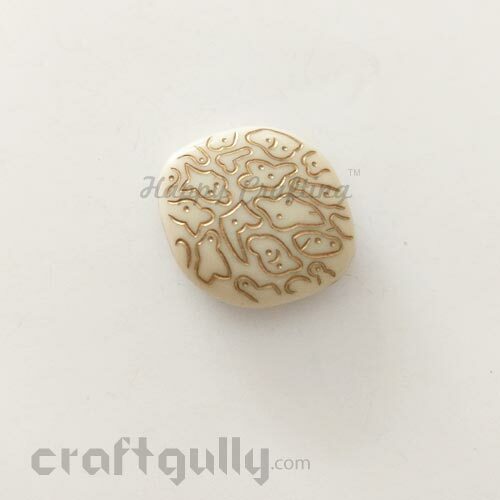 Use our acrylic beads to add a touch of elegance to your jewellery.Bead Size: Approx 13mm x 20mmBeading Length: Approx 13mm Hole Diameter: Approx 2.5mm Colour: White and Golden* Quantity: 2 beads in a pack *True color/s may vary slightly from what you see on your screen..
Light weight and versatile. Use these acrylic beads to add a touch of elegance to your jewellery.Bead Size: Approx 13mm x 7mmBeading Length: Approx 13mmQuantity: Pack of 4 beads Colors: Ivory And Golden* *True color/s may vary slightly from what you see on your screen..
Light weight and versatile. 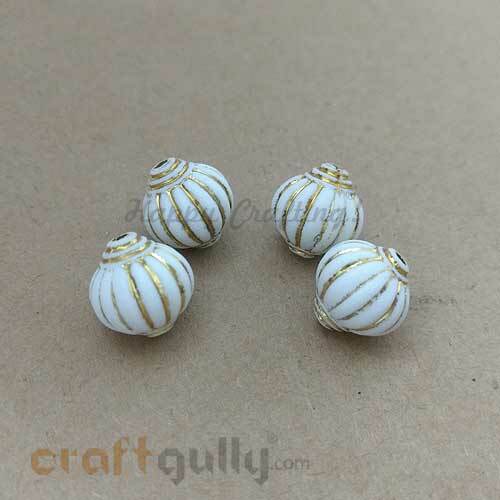 Use our acrylic beads to add a touch of elegance to your jewellery.Bead Size: Approx 14mm x 13mmBeading Length: Approx 14mm Hole Diameter: Approx 2.5mm Colour: White and Golden* Quantity: 4 beads in a pack *True color/s may vary slightly from what you see on your screen..
Light weight and versatile. Use our acrylic beads to add a touch of elegance to your jewellery.Bead Size: Approx 15mm x 12mmBeading Length: Approx 15mm Hole Diameter: Approx 1mm Colour: Bronze* Quantity: 4 beads in a pack *True color/s may vary slightly from what you see on your screen..
Light weight and versatile. Use our acrylic beads to add a touch of elegance to your jewellery.Bead Size: Approx 18mm x 17mm x 5mmBeading Length: Approx 18mm Hole Diameter: Approx 2mmColour: White and Golden* Quantity: 4 beads in a pack *True color/s may vary slightly from what you see on your screen..
Light weight and versatile. 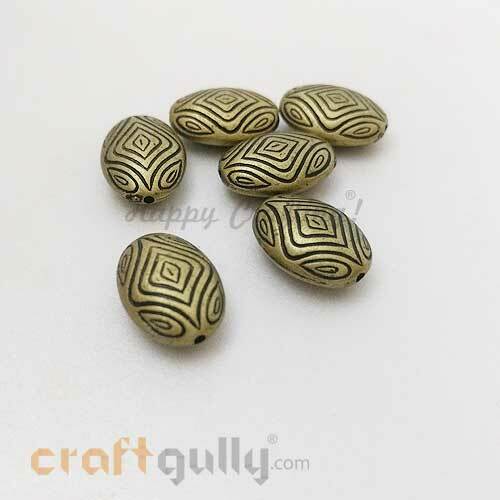 Use our acrylic beads to add a touch of elegance to your jewellery.Bead Size: Approx 18mm x 13mmBeading Length: Approx 18mm Hole Diameter: Approx 1mm Colour: Bronze* Quantity: 6 beads in a pack *True color/s may vary slightly from what you see on your screen..
Light weight and versatile. 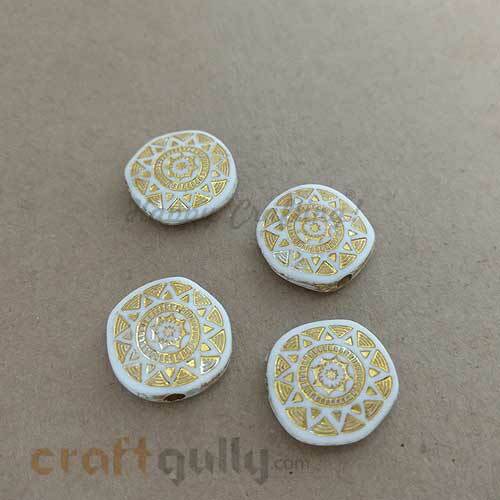 Use our acrylic beads to add a touch of elegance to your jewellery.Bead Size: Approx 18mm x 17mm x 5mmBeading Length: Approx 18mm Hole Diameter: Approx 2mmColour: Ivory and Light Golden* Quantity: 4 beads in a pack *True color/s may vary slightly from what you see on your screen..
Light weight and versatile. 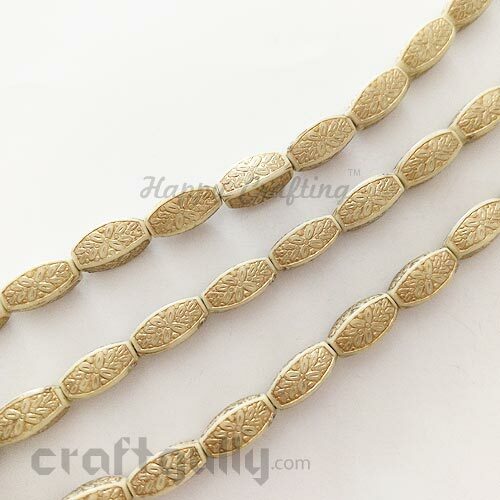 Use these acrylic beads to add a touch of elegance to your jewellery.Bead Size: Approx 28mm x 24mmBeading Length: Approx 28mmQuantity: Pack of 1 bead Colors: Ivory And Golden* *True color/s may vary slightly from what you see on your screen..
Light weight and versatile. 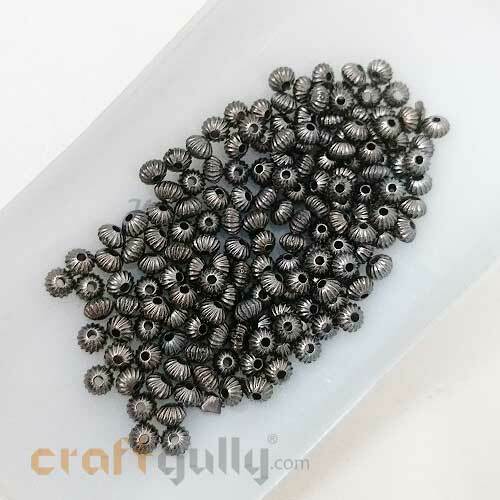 Use our acrylic beads to add a touch of elegance to your jewellery.Bead Size: Approx 3mm x 4mmBeading Length: Approx 3mm Hole Diameter: Approx 1mmColour: Gun Metal* Quantity: 5gms in a pack *True color/s may vary slightly from what you see on your screen..
Light weight and versatile. Use our acrylic beads to add a touch of elegance to your jewellery.Bead Size: Approx 5.5mm x 7mmBeading Length: Approx 5.5mm Hole Diameter: Approx 1mmColour: White and Silver* Quantity: 20 beads in a pack *True color/s may vary slightly from what you see on your screen..
Light weight and versatile. Use these acrylic beads to add a touch of elegance to your jewellery.Bead Size: Approx 6mm x 7mmBeading Length: Approx6mmQuantity: Pack of 10 beads Colors: Ivory And Golden* *True color/s may vary slightly from what you see on your screen..
Light weight and versatile. Use our acrylic beads to add a touch of elegance to your jewellery.Bead Size: Approx 8.5mm x 9mmBeading Length: Approx 8.5mm Hole Diameter: Approx 1.5mmColour: White and Silver* Quantity: 20 beads in a pack *True color/s may vary slightly from what you see on your screen..
Light weight and versatile. 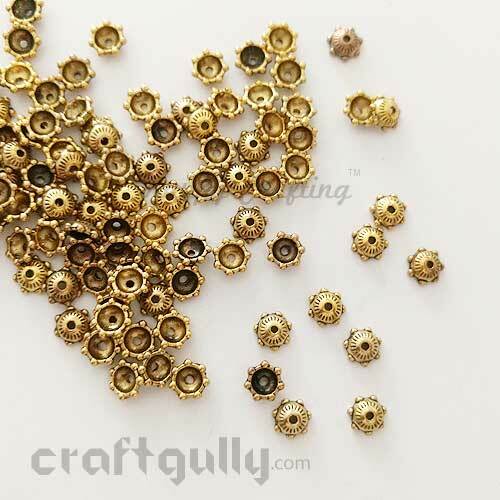 Use our acrylic beads to add a touch of elegance to your jewellery.Bead Size: Approx 8mm x 4mmBeading Length: Approx 8mm Hole Diameter: Approx 1.5mmColour: Antique Golden* Quantity: 50 beads in a pack *True color/s may vary slightly from what you see on your screen.. Intricate, light and delightful! 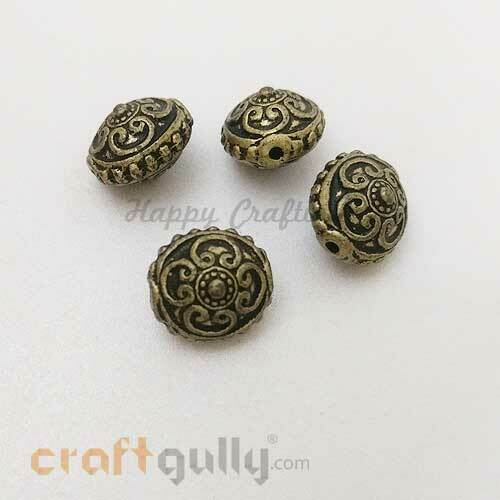 Use these metal beads as center pieces or spacers in your necklaces, earring, bracelets and accessories!! Size: Approx. 18mm x 3mm Inner Size: Approx 14mm Quantity: 2 bead rings in a pack Color: Silver finish* (note, these are not made of silver) Material: Metal * True color/s may vary slightly from what you see on your screen.. Size: 8mm Color: Green Quantity: 10 beads Material: Synthetic Amazon Stone/ Amazonite Color may vary slightly from what you see on your screen..